Lenin would be proud of them! Treasurer matches PM's breach of faith ... Kevin Rudd decided to use socialism to save capitalism; now that the crisis has passed, Wayne Swan . Useful idiot. Term invented in Soviet Russia to describe people who blindly supported the likes of Lenin and Stalin while they committed atrocity after atrocity. 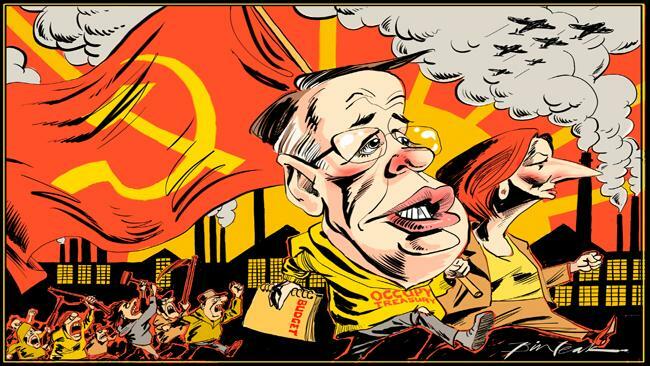 AT the height of the global financial crisis Kevin Rudd decided to use socialism to save capitalism; now that the crisis has passed, Wayne Swan has decided to use capitalism to save socialism. Rudd, when he was prime minister, wrote a long essay for The Monthly in which he said capitalism had damaged itself and it was then up to the socialists left in charge to salvage international finance and banking. Swan, earlier this year, wrote a long essay for The Monthly in which he set out a series of principles to make Australia a fair-go society and declared war on billionaire miners. Last night Swan redistributed the fruits of capitalism and those billionaire miners to make Australia a fair-go society and make amends to the low-income earners, families and pensioners who have felt the Gillard government didn't care or didn't understand about the pressures of rising costs of living. Swan goes as far as he can in declaring that shifting - "prioritising" - the funds from the minerals resource rent tax from big business to families is about compensating for the carbon price to come. Of course, the government has been talking about compensation for the carbon tax and trying to limit talk about the impact of the tax on prices but families already feeling rising power and water bills are in no mood to be told they'll be "over-compensated" for the tax. Like so much else from the government, they just don't believe it. What's more, Tony Abbott has built a highly successful political attack on cost-of-living rises for more than two years as part of his anti-carbon tax campaign. The Opposition Leader has the advantage because he is telling people something they agree with and are experiencing, while the government has only been able to push something it said would not happen and make assurances about things voters don't believe will happen. There is a crisis of belief for Labor that is feeding into a lack of national confidence which, in turn, is damaging economic prospects and growth. There has been a melding of a lack of political confidence with a lack of economic confidence. Labor's stocks are at a record low and consumer confidence is in the doldrums. Last night Swan sought to break the nexus; he's trying to make people sit up and start to listen again to the government and give them something tangible they can believe in. At the heart of Swan's redistribution of wealth is his long-standing belief in helping the battlers, Labor's base and, coincidentally, a group that has in large part abandoned the ALP. Swan's other principle at work in his fifth budget is his preparedness to upset big business which, again coincidentally, has largely abandoned Labor. Swan has shown a preparedness, eagerness even, to breach the longstanding undertaking to cut the corporate tax rate as part of "tax reform" and simply hand over the proceeds of the mining tax to families alienated by the carbon tax. It's almost an exact swap of funds when all else is stripped away. Swan has tried to repair the breach of faith with the broader electorate over the carbon tax by a new breach of faith with business. It works financially and politically for him to be redistributing what was going to big business to families in his attempts to recapture Labor's base. The Treasurer has been able to fund the redistribution with relatively few cuts to Labor's heartland and relatively few huge cuts to Labor's less friendly areas of defence, high-income earners and foreign aid. His long-term aim of delivering a surplus of $1.5bn has been deliberately buried by his far more popular measures in keeping with a "Labor budget". His appeal is to those who feel the mining boom is "someone else's boom". This is designed to acknowledge the pain Labor has been refusing to acknowledge for so long. Swan even felt the need to reiterate in his budget speech that the carbon tax "will not be levied on families" - so successful has Abbott's campaign been. But for Abbott, Swan's plan holds more than just an appeal to those feeling pain; it also challenges Abbott to oppose the redistribution of the mining tax to families feeling the pinch. This is the biggest challenge the Gillard government has been able to throw at Abbott as opposition leader. Swan's essay may end up being more successful than Rudd's.